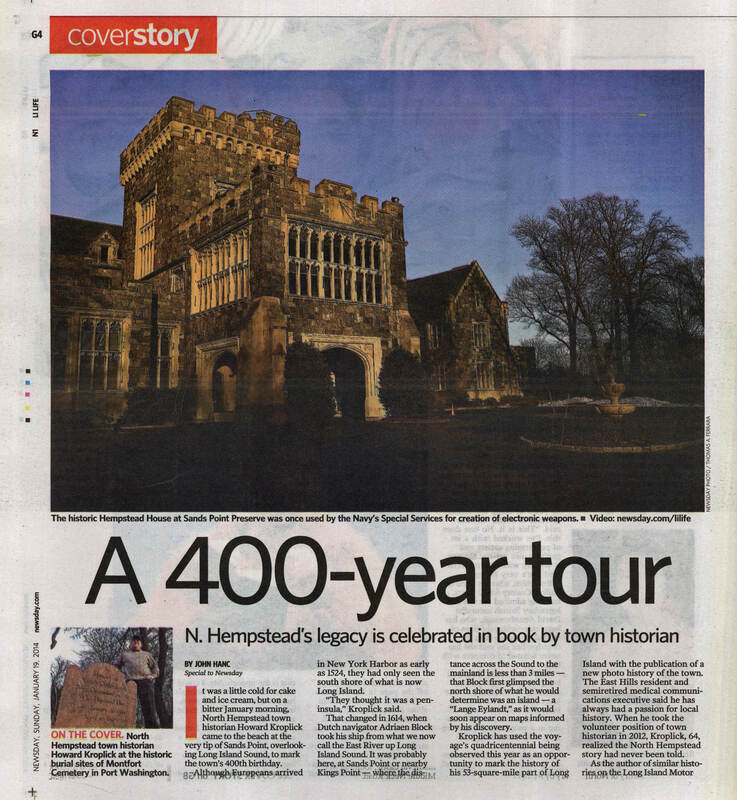 Newsday published a wonderful five-page LI life cover story on my new book North Hempstead. 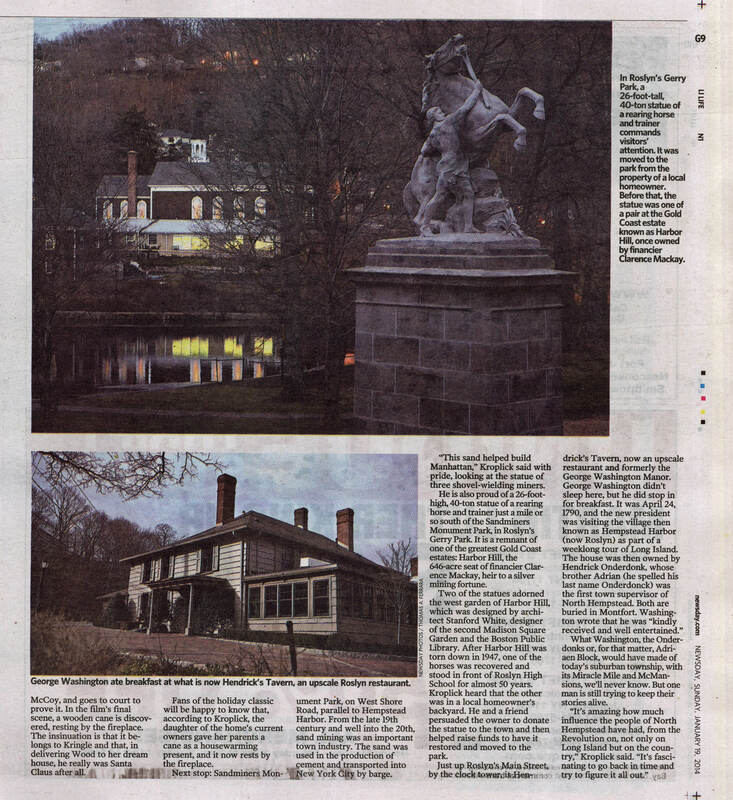 Congratulations to reporter John Hanc and photographer Tom Ferrara for capturing the book in this article. Please join me at 7:00 PM on Wednesday, February 5, 2014 for a book signing at Book Revue, 313 New York Avenue, Huntington.. All proceeds from this book signing will be donated to the Let's Do Lunch program of the Sid Jacobson JCC located in East Hills. It was a little cold for cake and ice cream, but on a bitter January morning, North Hempstead town historian Howard Kroplick came to the beach at the very tip of Sands Point, overlooking Long Island Sound, to mark the town's 400th birthday. Although Europeans arrived in New York Harbor as early as 1524, they had only seen the south shore of what is now Long Island. "They thought it was a peninsula," Kroplick said. That changed in 1614, when Dutch navigator Adriaen Block took his ship from what we now call the East River up Long Island Sound. It was probably here, at Sands Point or nearby Kings Point -- where the distance across the Sound to the mainland is less than 3 miles -- that Block first glimpsed the north shore of what he would determine was an island -- a "Lange Eylandt," as it would soon appear on maps informed by his discovery. 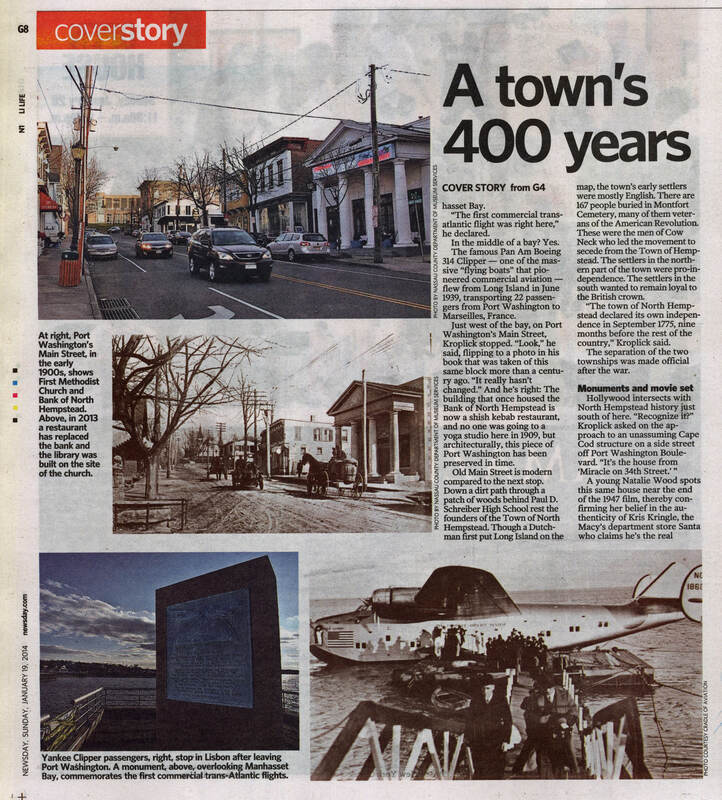 Kroplick has used the voyage's quadricentennial being observed this year as an opportunity to mark the history of his 53-square-mile part of Long Island with the publication of a new photo history of the town. The East Hills resident and semiretired medical communications executive said he has always had a passion for local history. When he took the volunteer position of town historian in 2012, Kroplick, 64, realized the North Hempstead story had never been told. As the author of similar histories on the Long Island Motor Parkway and the Vanderbilt Cup races of the early 1900s, Kroplick approached the publisher of the popular "Images of America" series about a volume devoted to the history of North Hempstead. It took months of digging in the archives of local historical societies and libraries, but the book, featuring 200 photos, was published in January by Arcadia. The historic heart of the township encompasses most of what has become known as the Gold Coast. Its approximate modern boundaries are Old Country Road to the south, Oyster Bay to the east and Queens to the west. 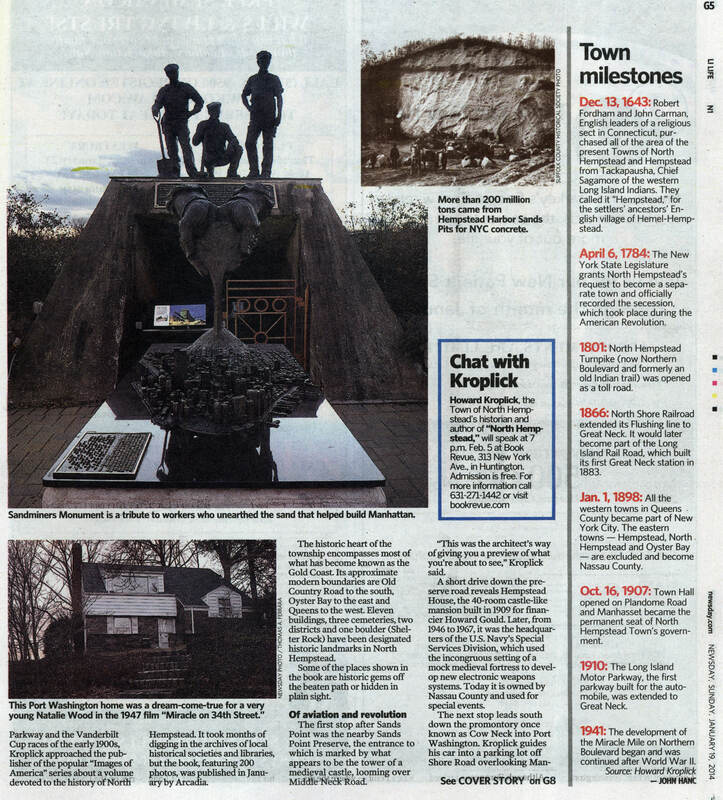 Eleven buildings, three cemeteries, two districts and one boulder (Shelter Rock) have been designated historic landmarks in North Hempstead. Some of the places shown in the book are historic gems off the beaten path or hidden in plain sight. The first stop after Sands Point was the nearby Sands Point Preserve, the entrance to which is marked by what appears to be the tower of a medieval castle, looming over Middle Neck Road. "This was the architect's way of giving you a preview of what you're about to see," Kroplick said. A short drive down the preserve road reveals Hempstead House, the 40-room castle-like mansion built in 1909 for financier Howard Gould. Later, from 1946 to 1967, it was the headquarters of the U.S. Navy's Special Services Division, which used the incongruous setting of a mock medieval fortress to develop new electronic weapons systems. Today it is owned by Nassau County and used for special events. The next stop leads south down the promontory once known as Cow Neck into Port Washington. Kroplick guides his car into a parking lot off Shore Road overlooking Manhasset Bay. "The first commercial transatlantic flight was right here," he declared. In the middle of a bay? Yes. The famous Pan Am Boeing 314 Clipper -- one of the massive "flying boats" that pioneered commercial aviation -- flew from Long Island in June 1939, transporting 22 passengers from Port Washington to Marseilles, France. Just west of the bay, on Port Washington's Main Street, Kroplick stopped. "Look," he said, flipping to a photo in his book that was taken of this same block more than a century ago. "It really hasn't changed." And he's right: The building that once housed the Bank of North Hempstead is now a shish kebab restaurant, and no one was going to a yoga studio here in 1909, but architecturally, this piece of Port Washington has been preserved in time. Old Main Street is modern compared to the next stop. Down a dirt path through a patch of woods behind Paul D. Schreiber High School rest the founders of the Town of North Hempstead. Though a Dutchman first put Long Island on the map, the town's early settlers were mostly English. There are 167 people buried in Montfort Cemetery, many of them veterans of the American Revolution. These were the men of Cow Neck who led the movement to secede from the Town of Hempstead. The settlers in the northern part of the town were pro-independence. The settlers in the south wanted to remain loyal to the British crown. "The town of North Hempstead declared its own independence in September 1775, nine months before the rest of the country," Kroplick said.The separation of the two townships was made official after the war. Hollywood intersects with North Hempstead history just south of here. "Recognize it?" Kroplick asked on the approach to an unassuming Cape Cod structure on a side street off Port Washington Boulevard. "It's the house from 'Miracle on 34th Street.' "
A young Natalie Wood spots this same house near the end of the 1947 film, thereby confirming her belief in the authenticity of Kris Kringle, the Macy's department store Santa who claims he's the real McCoy, and goes to court to prove it. In the film's final scene, a wooden cane is discovered, resting by the fireplace. The insinuation is that it belongs to Kringle and that, in delivering Wood to her dream house, he really was Santa Claus after all. Fans of the holiday classic will be happy to know that, according to Kroplick, the daughter of the home's current owners gave her parents a cane as a housewarming present, and it now rests by the fireplace. Next stop: Sandminers Monument Park, on West Shore Road, parallel to Hempstead Harbor. From the late 19th century and well into the 20th, sand mining was an important town industry. The sand was used in the production of cement and transported into New York City by barge. "This sand helped build Manhattan," Kroplick said with pride, looking at the statue of three shovel-wielding miners. He is also proud of a 26-foot-high, 40-ton statue of a rearing horse and trainer just a mile or so south of the Sandminers Monument Park, in Roslyn's Gerry Park. It is a remnant of one of the greatest Gold Coast estates: Harbor Hill, the 646-acre seat of financier Clarence Mackay, heir to a silver mining fortune. Two of the statues adorned the west garden of Harbor Hill, which was designed by architect Stanford White, designer of the second Madison Square Garden and the Boston Public Library. After Harbor Hill was torn down in 1947, one of the horses was recovered and stood in front of Roslyn High School for almost 50 years. Kroplick heard that the other was in a local homeowner's backyard. He and a friend persuaded the owner to donate the statue to the town and then helped raise funds to have it restored and moved to the park. Just up Roslyn's Main Street, by the clock tower, is Hendrick's Tavern, now an upscale restaurant and formerly the George Washington Manor. George Washington didn't sleep here, but he did stop in for breakfast. It was April 24, 1790, and the new president was visiting the village then known as Hempstead Harbor (now Roslyn) as part of a weeklong tour of Long Island. The house was then owned by Hendrick Onderdonk, whose brother Adrian was the first town supervisor of North Hempstead. Both Onderdonks (also spelled Onderdonck) are buried in Montfort. Washington wrote that he was "kindly received and well entertained." What Washington, the Onderdonks or, for that matter, Adriaen Block, would have made of today's suburban township, with its Miracle Mile and McMansions, we'll never know. But one man is still trying to keep their stories alive. "It's amazing how much influence the people of North Hempstead have had, from the Revolution on, not only on Long Island but on the country," Kroplick said. "It's fascinating to go back in time and try to figure it all out." Another great great job, Howard. Congrats! Loved the story about your book—lots of nostalgia from my years on Long Island, 1960-1975—wish I could be at your signing!